For an executive summary of this piece, click here. In the wake of the 2012 election, one point on which practically all Republicans seemed to agree was that their party’s presidential-nomination process was broken. Supporters of the GOP’s eventual nominee, Mitt Romney, believed that the nature of the process weakened him for the general election. The party’s base of conservative activists, meanwhile, believed that the process favored the candidates with the most money, and therefore the views of (often less conservative) wealthy donors. More moderate Republicans thought the process elevated a parade of unserious firebrands who were never real contenders, thereby damaging the party’s image with swing voters. And Republicans of all stripes thought the unpleasantness of the process had motivated the strongest candidates to sit out the election entirely. Today’s nominating process weakens the GOP candidate and fails to produce consensus within the Republican Party itself. All of them were right: The Republican Party’s presidential-nomination process fails to serve the aims of its voters. And this failure results, at least in part, from the fact that the GOP’s process was never designed with conservative goals in mind. Instead, in a peculiar historical turn some four decades ago, Republicans adopted a process that was designed for the Democratic Party by its most liberal activists: New Left reformers who sought to wrest power from Democratic insiders in order to give it to their base. Shortly after the new Democratic primary process was put in place, Republicans emulated it in almost every detail. That system was never a good fit for Republicans; in recent years, however, it has grown even more inimical to the party’s interests. There is no reason for this state of affairs to continue. Instead of preserving a primary process designed for its political rival, the Republican Party should draw on its own principles to create a better method of choosing presidential nominees. By crafting a new nomination process modeled after the process that ratified the Constitution, Republicans could provide themselves with a more dignified, more representative, and more effective means of selecting a candidate. In so doing, they could also render a great service to the nation—by improving their ability to advance the limited-government, pro-market policy reforms America now so desperately needs, and by restoring competitiveness, responsiveness, and vitality to our political system. Presidential candidates haven’t always spent a whole year in Iowa coffee shops and New Hampshire town halls trying to win their parties’ nominations. Prior to 1972, the nomination process for both parties was dominated by state political organizations, which would send delegates of their choosing to the quadrennial national convention to select a nominee. Some state parties had opened up the process through primary elections, but many kept it closed to all but party insiders. It was this closed process that yielded Hubert Humphrey as the Democratic nominee in 1968, despite the fact that he had participated in exactly zero primaries. Angered by this result, the emerging New Left of the party—led by George McGovern, Ted Kennedy, and other young liberals—won a major concession at the convention: a commitment from the party brass to open up the nomination process. The New Left subsequently took control of this reform effort, with the intention of moving the party toward open caucuses, where passionate liberal candidates were most likely to prevail. McGovern, Kennedy, and their allies believed that this would result in a permanent shift of influence away from old-guard party bosses—like urban politicos, industrial union leaders, and Southern pols—and toward their activist base. But the New Left miscalculated. Many old-guard Democrats, rather than cede control to what they considered to be a bunch of left-wing radicals, used the freedom that the national party had given the state organizations to move toward statewide primaries instead of caucuses. They believed that this move would dilute the political power of the New Left—which it did. Republicans eventually followed the Democrats’ lead, even though the old process had not created internal rifts in the GOP the way it had among the Democrats. Almost as a matter of convenience (to allow states to hold both parties’ primaries on the same day), and with remarkably little care or consideration, the Republican Party accepted a presidential-nomination process designed by its political adversaries. This is how America has wound up with the peculiar nomination process it now has. Whereas the original, convention-based process was the result of a carefully considered decision by politicians in the Jacksonian era to reject “King Caucus,” today’s mess is the product of accident and afterthought. It should surprise no conservative that unintended, negative consequences have abounded. Some of these problems are common to both Democrats and Republicans, while others are unique to the GOP. Without doubt, one of the most troublesome aspects of the current system is its gross inefficiency. Whereas generations ago selecting a nominee took relatively little time and money, today’s process has resulted in a near-permanent campaign. Because would-be nominees have to win primaries and open caucuses in several states, they must put together vast campaign apparatuses that spread across the nation, beginning years in advance and raising tens of millions of dollars. The length of the campaign alone keeps many potential candidates on the sidelines. In particular, those in positions of leadership at various levels of our government cannot easily put aside their duties and shift into full-time campaign mode for such an extended period. In the early days of the republic, the secretary of state was often a prime contender for the White House. Today, it would be nearly impossible for one person to fulfill the obligations of a presidential candidate and those of America’s top diplomat without seriously shortchanging both responsibilities. This near-permanent campaign also requires candidates to spend an inordinate amount of time raising money just to compete for the nomination. Generally, only a couple of candidates have sufficient access to such money, and they are joined in the race by those who have essentially no money but are eager for the 15 minutes of fame they receive by sharing a debate stage with legitimate contenders. These low-budget candidates tend to use their newfound notoriety to self-promote or to float pet policies. The result is that, before he even runs against a Democrat, the eventual Republican nominee must respond to baseless attacks and fringe ideas that can discredit the whole party. It’s no wonder that many statesmanlike candidates hesitate to run, and that those who do become less statesmanlike in the process. Taken together, this makes for a process that does a poor job of selecting viable presidential contenders. It takes too long and costs too much, deters good leaders from running, and diminishes those who do run. The party does not end up having a sober conversation about its past, present, and future. Instead, the eventual nominee is dragged through the muck to no real purpose. Today’s nominating process doesn’t just weaken the GOP candidate before he faces off against the Democrats: It also fails to produce consensus within the Republican Party itself. Whereas under the old convention system delegates were required to reach a consensus choice—no matter how long it took—today’s system is mostly a test of survival. Candidates now do not need to cobble together a majority of the Republican electorate so much as they need to mobilize a sufficiently large minority of it and then wait for the other candidates to fold as the media declares that their campaigns are doomed. Worse, the scope of citizen participation in this charade is exceedingly narrow, despite the fact that the process has nominally been expanded in many states to include voters (such as registered independents) who are not affiliated with the party. The reason is that the winnowing process regularly cuts the number of viable candidates down to only one halfway through the nomination contest, if not far earlier. For example, in 2012, the Republican nomination battle effectively ended with the Wisconsin primary on April 3, even though Mitt Romney won less than half the vote there. States whose contests were held afterward—including Texas, California, New Jersey, New York, North Carolina, and Pennsylvania—did not have competitive primaries and thus had no real say in the selection of the nominee. Though the reforms of the nominating process that began in the 1960s and ‘70s were intended to better represent the will of the voting public, the result has been a system that does not reflect the interests and values of the nationwide Republican electorate at all. Instead, inordinate amounts of power are held by a handful of groups that do not represent the broader party or its interests. First are the elite donors, who contribute large amounts of their own funds and also solicit contributions from others as “bundlers.” These are the people who have the capacity to bankroll primary candidates, and they usually reside in major urban centers (rather than in suburban and rural areas where most Republican voters live). Sometimes their views are broadly in line with those of the GOP electorate; more often, they have very narrow, highly personal policy priorities. But in the prolonged, resource-intensive primary campaign, these donors have vastly outsized influence—and the need to appeal to big-money figures can lead candidates to focus on issues of very limited interest to the general voting public. The second group is the media. Since the emergence of the modern primary system, the press has played a decisive role by assigning candidates “momentum.” Journalists—who vote overwhelmingly Democratic—influence the result by declaring who is “up” and who is “down.” What’s more, the emergence of an extensive televised debating process has given reporters even greater power: They get to ask the questions of the contenders and to referee the arguments among them, during the only exposure to the candidates that many voters will have. More often than not, the goal of these journalists is not to inform the Republican electorate but to create storylines by embarrassing candidates or forcing them to answer unrealistic hypothetical questions. The third group is made up of a handful of state governments—like those of New Hampshire, Michigan, and Florida—that have positioned themselves at the beginning of the primary process. These states, competing to preserve their status as early deciders, push the nomination process further and further forward—not because it is good for the country, but because it makes their states more important and gives their voters hugely disproportionate influence over our politics. Both the Republican and Democratic organizations in these states are complicit in this scheme, and though the national Republican Party has complained, it has little recourse. The state organizations know that candidates will participate in the primaries however early they are set, that the media will simply extend its coverage, and that these states will continue to enjoy their undue significance. The fourth powerful group is the relatively new class of professional campaign consultants. Facing a contest that lasts longer than the general-election campaign and is nearly as complex, candidates for the GOP nomination have to rely heavily on campaign consultants. Like the elite donors, these people are (usually) Republicans, but they have an influence that is disproportionate to their numbers. They hold the positions they do because of their skills (polling, advertising, message formation, and so forth), not because they necessarily share the views of the broader GOP electorate. Finally, there is the rise of a group euphemistically known as “low-information voters.” As more states (24 of them by 2012) have allowed “open” or “semi-closed” primaries—in which a voter need not even be a registered Republican to participate—the party’s nominee-selection process has grown increasingly disconnected from the priorities of its members and voters. This has had a significant effect on the process, as the winning candidate often claims victory not so much because he has articulated the values and interests he shares with the whole party, but because his advertisements managed to sway the late-deciding, quasi-independent voters who have little stake in the outcome. Thus the crucial question for understanding what ails the Republican Party is, to borrow a phrase from political scientist Robert Dahl, “Who governs?” Despite moves to make the process more open over the past two generations, the answer to that question is these five groups—and not the tens of millions of voters who support the GOP year in and year out at the ballot box. This problem cannot be viewed in isolation, either. More and more, Republican voters are beginning to see a problem with their own party. A Pew Poll in February found that 36% of self-identified Republicans thought their party was “out of touch” with the American people, compared to just 23% of Democrats who thought the same of their own party. Moreover, Romney won the presidential election among independents by five percentage points (according to exit polling) but still lost overall by four points, largely because many conservatives (Tea Party or otherwise) no longer call themselves Republicans, preferring the moniker “independent” instead. No political party can thrive in the long term if it is not a mass-based organization, drawing support and enthusiasm from a broad array of Americans (and certainly from its own base). Many thoughtful conservatives have pointed to the absurdities of the existing nomination process, but most proposals seek to tinker around the edges by limiting the number of debates or by including more states in the early contests. These ideas are helpful, but they do not go nearly far enough. The core of the problem is that the current process empowers several groups that are not representative of most Republican voters. Any successful reform effort must therefore shift the balance of power to the party’s grassroots. People who live on the Upper East Side of Manhattan and contribute money to Republicans, people who live in Northern Virginia and do polling for the party, and Democratic-voting members of the mainstream media should not have considerably more say than the average Republican voter. The question, then, is how to give the typical voter that power. The best way to draw more Republicans into the candidate-selection process is to revitalize the local and state party organizations. The contemporary system contributed significantly to the decline of these groups, which used to possess real political power and thus attracted the attention and involvement of the grassroots. Today, conservatives who want to get involved in politics rarely, if ever, look to their state and local parties. And why should they? Local parties are no longer a locus of political power or influence. Unfortunately, state and local party organizations are misremembered as un-republican and corrupt. More often than not, they conjure images of the “smoke-filled rooms” in which corrupt influence-peddlers traded favors for nominations. Yet the Tammany Hall days are now generations past, and, in reality, such corruption was never as prevalent as people now believe. Most Republican nominees between the Civil War and the Great Depression were not wrapped up in machine corruption, and William McKinley actually won the nomination in 1896 despite having denied the party bosses the patronage system they desired. The reformers of the 1960s thus threw the baby out with the bathwater: Party organizations surely needed to be reformed, but instead they were effectively destroyed. Any proper reform effort should breathe new life into these organizations. But that does not necessitate a return to the old national convention system: That ship has definitely sailed. Instead, reformers should follow the intuition of the old system—that state and local party organizations have an important role to play—and apply it to the modern electoral landscape that Republicans now face. The ultimate goal should be to democratize, in a meaningful sense, the nomination process, so that Republicans all across the country feel as though they have a real voice in the process and that their nominee represents them. The framers of the Constitution realized the importance of citizen participation in the establishment of our government. In 1787 and ‘88, the 13 states held ratifying conventions to determine the fate of the newly proposed Constitution. That document had been written and signed during the summer of 1787 at Philadelphia’s Independence Hall but, by its own terms, would not take legal effect unless two-thirds of the states ratified it. Ratification required each state to set up a ratifying convention of delegates; though the manner of selection was not specified, in most states, these delegates were chosen by the people. The delegates then cast an up-or-down vote on the proposed Constitution. Apart from the regrettable limits on who was eligible to vote (generally confined to white male property owners), this process of ratification was quite republican, open to a broad swath of the country while still promoting careful deliberation. Indeed, the republican nature of the process provided the legitimacy necessary for superseding the amendment provisions of the Articles of Confederation. Today’s Republicans should learn from the framers’ republican example. If locally selected delegates decided something as weighty as whether to adopt the Constitution, wouldn’t a similar process be fitting for determining the Republican Party’s presidential candidate? It is in this spirit that we propose the following procedure for selecting the GOP presidential nominee. During the week of Lincoln’s birthday (February 12), the Republican Party would hold a Republican Nomination Convention that would borrow from the process by which the Constitution was ratified. 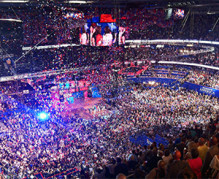 Delegates to the convention would be selected by rank-and-file Republicans in their local communities, and those chosen delegates would meet, deliberate, and ultimately nominate five people who, if willing, would each be named as one of the party’s officially sanctioned finalists for its presidential nomination. Those five would subsequently debate one another a half-dozen times. Their fate would ultimately be decided by Republican voters from every state in a series of regional, direct-ballot elections. If nobody won more than half the vote, or won by at least ten percentage points, there would be a runoff between the top two finishers. Through such a process, GOP voters across the country would finally have a say not only in who would ultimately become the nominee, but also in selecting the candidates among whom they would get to choose. As a result, the five formally chosen finalists would be much more likely to be among the best and the brightest the party could offer than has generally been the case with candidates under the current system. Meanwhile, the new system would reinvigorate local and state party organizations, which would play important roles in conducting the elections of delegates. The entire selection process would generally be wrapped up by the end of April, and the nominee could then focus on staffing a campaign, raising money for the general election, picking a running mate, preparing for the made-for-TV convention in the summertime, and mounting a case against the prospective Democratic nominee. To clearly show all the benefits of this proposal, we need to dig into the details. The Republican Nomination Convention would include about 3,300 delegates, 3,000 of whom would be elected by rank-and-file Republican voters across the nation in elections put on by local chapters of the Republican Party. Each delegate would represent about 22,000 Republicans, ensuring a strong level of local influence. Given Republican registration rates, this means a typical town of 100,000 people would have a delegate at the nomination convention. A heavily Republican town of that size would have two. An average-sized state like Missouri would have about 60 such delegates at the convention. In addition, each Republican member of the House and Senate, each GOP governor, and (during a Republican administration) each Republican cabinet secretary would also be invited to serve as a convention delegate. These delegates would make up the additional 300 or so at the convention. All in all, about 90% of the delegates would be selected by Republican voters for that express purpose; the other 10% would be Republican officeholders. During the years in which an incumbent Republican president was eligible for re-election, the nomination-convention delegates would first cast votes indicating whether they supported the president’s nomination for a second term. If three-quarters of the delegates supported renominating the sitting president—a threshold that Richard Nixon, Ronald Reagan, and George W. Bush would likely have had no problem surpassing, but that Gerald Ford and even George H. W. Bush may not have reached—the sitting president would become the convention’s sole nominee. Otherwise, and in all years in which there was not a sitting Republican president eligible for re-election, the whittling process would then follow these set steps: The delegates would cast three preliminary votes. During each vote, every delegate would list on his ballot up to five prospective candidates for the party’s presidential nomination, in order of preference. The candidate listed first would get five points, the second four, and so forth. (An incumbent Republican president who had fallen short of the three-quarters threshold would be eligible to be listed on such ballots.) The results for every round would be tabulated and released, including each candidate’s point total. The votes would be spread out so that the whole process would last two or three days. During the time between each round of voting, delegates would be able to see which potential candidates were faring well, which were not, and which might be poised to make a move. Deliberations about the merits of various candidates would ensue, delegates would rethink their ballots, and informal coalitions might begin to form. After two such preliminary votes involving various prospective candidates, the convention would then have one last chance to affirm its support for an incumbent Republican president who was eligible for re-election but who had fallen short of the requisite three-quarters majority at the start of the convention. In such instances, a second vote on the incumbent would be taken at this time. If two-thirds of the delegates supported his nomination, he would then become the convention’s sole nominee. Otherwise, or in years without a Republican president who was eligible for re-election, the process would then proceed to a third preliminary vote. This third (and last) preliminary vote would take on added importance, as it would determine which ten candidates would be eligible to be considered for the final vote. The results of the third preliminary vote would be tallied; the candidates who finished in the top ten would each be notified by a convention official; and each candidate’s willingness to accept a nomination to the final field of five (should that nomination be forthcoming) would be affirmed. If any of the ten refused to accept a possible nomination, the eleventh candidate on the list would move into the tenth spot, and so on. The full list of the top ten willing candidates would then be released, in order, complete with their scores. A half-day or so after the third preliminary vote, the delegates would then cast their final votes. As with each of the three preliminary votes, each delegate would be allowed to list up to five candidates on his ballot, in order. Once the final votes were cast and tabulated, the results would then be released, with this difference: The only information revealed would be the names of the five highest scorers, listed in alphabetical order. Point tallies would not be released. Like the nominees for a given category at the Academy Awards, all five candidates would start off on equal footing—having emerged from the Republican Nomination Convention as the officially chosen finalists to be their party’s presidential standard-bearer. Two weeks later, the first GOP presidential debate would occur, with those five candidates—and only those candidates—invited to participate. Each week for a month, another debate would take place among these five finalists. Ideally, questions would be asked by conservative journalists or conservative audience members. Through these four debates, Republican voters would get an even better sense of each candidate’s beliefs, proposals, manner, and appeal. Near the end of March—a week after the fourth debate—Republicans in roughly one-third of the states would cast votes for their preferred candidates. (The order in which states voted would rotate every four years, as negotiated by the state and national party organizations, which would no longer have to worry about the intrusion of state governments on the process.) After that day of voting, one or more of the candidates might choose to drop out, thereby focusing the remaining voters on the most viable choices. The following week, there would be another debate—the fifth—followed a week later by a vote in the second third of the states. The subsequent week, in mid-April, there would be a final debate, followed a week later by a vote in the final third of the states. Because these votes would represent a departure from states’ chosen times or manners of conducting primary elections, the Republican Party—that is, a blend of the national, state, and local party organizations—would have to run these elections itself. This could be done in any number of ways, including with the assistance of private firms that specialize in such large-scale logistical operations. The votes could be held in person in homes, gyms, and the like; by mail, as elections are now run in Oregon and Washington; over the phone (with password checks), as voting for reality-television shows is now conducted; or online (again, with password checks), as voting for the Oscars is now conducted. To be sure, any such method would require notable effort and significant sums of money, but those sums would pale in comparison to the enormous amounts spent during the current nomination process. Moreover, many rank-and-file Republicans would likely be more than happy to donate small sums of money to help stage such elections as part of a process that increased their influence, finding it preferable to sending larger sums of money to particular candidates as part of a process in which their influence is marginalized. Each state party would continue to be free to decide in advance how to allocate its delegates to the summertime convention—whether on a winner-take-all or proportional basis, or some combination of the two—and that convention would remain the site at which the formal nomination would be made official as a result of those delegates’ votes. If no candidate won at least 50% of the delegates nationwide, or if no candidate won the nationwide delegate race by at least ten percentage points, a runoff between the top two candidates—with their delegate slates wiped clean beforehand—would take place in May, two weeks after the third and final grouping of states voted in late April. The runoff elections would be winner-take-all by state and would effectively guarantee that one candidate would win a majority of the delegates. Thus, by the end of April (or, in the event of a runoff, by mid-May), in almost all instances, Republican voters across the country would have indirectly participated in narrowing the Republican field down to five finalists, would have watched a half-dozen debates among those chosen finalists, would have cast ballots for their favorites among them, and would have a de facto nominee. And, more than likely, that nominee would not only be among the party’s best and brightest, but would actually reflect the party’s core principles and its reformist spirit—in contrast with the candidates too often produced by the money-based system that’s now in place. This proposal would certainly amount to a dramatic break with the status quo, but such a break is necessary to re-order the power relations within the GOP. As they stand, the party’s nomination procedures are a mess. An elite group decides who the major candidates will be, what will be discussed during the campaign, and how it will be discussed. Then some geographically privileged subset of the broader Republican electorate, supplemented by low-information independent voters, makes the final decision. The entire process eschews deliberation and marginalizes the Republican base. This proposed alternative tries to counter both of these tendencies by redistributing power to the grassroots of the party while also encouraging those loyalists to use their newfound influence in a responsible and deliberative way. The benefits of this transformation would be enormous. To begin, candidates would not formally have to enter the race until they were selected by the nomination convention. Of course, some candidates would express interest early, but it probably wouldn’t do them much good. They would not have any realistic hope of being able to stack the convention with their own supporters. The sheer volume of delegates—3,000 men and women chosen by Republicans all across the nation—would make this impossible, and delegates would not be bound to any one candidate in any event. Crucially, this shortened campaign season would reduce the importance of both the moneyed interests who fund campaigns and the political consultants who determine how those funds are spent. For at least three reasons, the importance of television advertising in particular—a huge campaign expense—would be drastically reduced. First, the debates would become the centerpiece of the brief campaign window between the nomination convention and the casting of ballots. Second, a third of the country would vote on each of the three days of primaries, making it impractical to saturate the airwaves with ads (as candidates can when they must devote their resources to only one state, or only a few). Third, with five legitimate candidates, negative ads—which generally succeed by focusing on taking down one challenger—would be rendered less effective. Just as money would no longer hold such extraordinary power over the nomination process, neither would the press corps. Because every Republican from coast to coast would be invited to cast a ballot within a five-week span, there would be mercifully little opportunity for assignments of “momentum” to hold sway. As for the debates, the candidates’ performances would largely speak for themselves; moreover, because the party would sponsor these debates, it could pick responsible moderators rather than media figures looking to generate controversy. State governments, too, would see their power decline. Because the Republican Party itself would have complete control of the nomination process, the GOP would ensure that the process worked to the maximum benefit of the party, rather than to the benefit of a few states. Moreover, a shift away from negative advertising would make impressionable low-information voters less of a problem. If candidates could no longer count on dropping millions of dollars’ worth of negative ads into a state to sway the barely attached to their side, then the whole process would become more deliberative and productive. Additionally, this system would encourage Republicans to organize on a grassroots level—as state and local party organizations would, for the first time in nearly half a century, possess real political power. Republicans today are deeply concerned about the advantages that Democrats possess in “get out the vote” operations. What better way to counter this Democratic edge than to bring millions of people directly into the party organization itself? This process would also give the GOP a real and productive opportunity for critical self-examination. That kind of benefit does not reliably exist when fringe candidates dominate the conversation. Winnowing the field would ensure that more serious candidates tossed their hats into the ring, producing a real debate. Finally, it would put the Republican Party in a better position for the November election. First, the elimination of the extensive pre-primary burdens would make serious and appealing candidates more willing to run. Under the current rules, an attractive candidate who does not feel sufficiently well connected to financial resources, is too busy with his current job, thinks he is not “ripe” for a presidential contest, or is, for whatever reason, reticent to run is not likely to enter the fray. But such a candidate would be far more amenable to participating in a process that would span no more than three months (unless he became the party’s nominee, in which case it would span no more than nine months). He would also be joining the contest after having been formally selected as a finalist by his party—an honor by any measure—and would have been put on a roughly even playing field with the four other finalists. Few politicians would turn down a formal invitation from millions of voters to run for president. Second, in compressing the nomination cycle, this process would reduce the amount of intra-party bloodletting. Today, negative ads and silly storylines take their toll on any frontrunner. A compressed cycle and a more rarified field would put the party on better footing for the general election, as Democrats would not be able to take advantage of the party’s internecine battles. Additionally, the money that this proposal would save—namely, most of the tens of millions of dollars that are spent every four years on the nomination contest—could be redirected to the general election, where Democrats now regularly outraise Republicans. Republicans need to understand just how perilous their political situation is. It is not simply that the GOP has been having trouble winning national elections, or that it has failed again and again to enact its vision of limited government, greater economic freedom, and a restoration of family values. The problem is that Republicans fail to achieve their policy aims while also alienating a multitude of sympathetic voters who are the foundation of any party in a representative democracy. These voters correctly perceive that they don’t have a meaningful role in the Republican organization. This is a recipe for a massive political unraveling. To prevent that unraveling, Republicans cannot be content with tinkering around the edges. The GOP’s problems will not be solved merely by adjusting the calendar, having more or fewer debates, moving some states forward and others backward in the voting order, or toggling between winner-take-all and proportional allocations of delegates. The dysfunctions are deep, which means the reform must be ambitious. Such a reform is essential to the Republican Party’s future, but it should be of interest and concern to more than just Republicans. To be well governed, our nation requires a competitive political system, with representative parties that give voice to the best of the ideals for which they stand. While neither party can claim to offer this today, and while Democrats have their own procedural problems to address, a reform of this nature is simply more urgent for Republicans, who are now more or less playing by the Democrats’ rules. Moreover, the GOP’s failure to remain a viable party would be extremely damaging to the health of our political system, and so to our republic. To that end, it is well past time for the Grand Old Party to institute a nomination process of its own design, one inspired by the framers rather than copied from the left. A process like the one outlined here would benefit Republicans in myriad ways. It would attract fine candidates who, under the existing system, would not be willing to enter the fray. It would promote a more serious discussion of how the party should govern. It would not force the GOP’s nominee into embarrassing sideshows. It would encourage greater grassroots involvement in, and affiliation with, the Republican Party. It would strengthen local parties, an essential but neglected civic association. It would make the party’s nomination process more efficient, more cost-effective, more deliberative, more consensus based, more republican, and more conducive to victory. Most important, this process would place the power to determine the GOP’s presidential nomination back where it belongs: in the hands of rank-and-file Republicans. © 2013 by National Affairs. Reprinted by permission.